Kishkinta, a long standing theme park next to Tambaram has been upgraded over the years and has cool new rides and toys for you to check out! Nearly 120 acres of amusement is what awaits at this amusement park. Kishkinta was one of the first amusement parks in Chennai, and it’s novelty back then was in its water rides and that’s what it has stuck to since. The rides have been upgraded and there are new shows as well. Fan favourites include the Anaconda, which will have you hurtling down a tube at great speed as you ultimately get thrown into a massive pool and the new Water Volcano, which is basically a simulated Tsunami — are the most used rides. There’s also a water playground called Water Wars, a roller coaster through water, a white water rafting ride, a slip n slide, a waterfall and boating for those of you who’d like to stay dry. Speaking of wanting to stay dry, there are dry rides too! A roller coaster called the Zyclone, a Tora Tora, Space Shuttle, bumper cars, and a train. 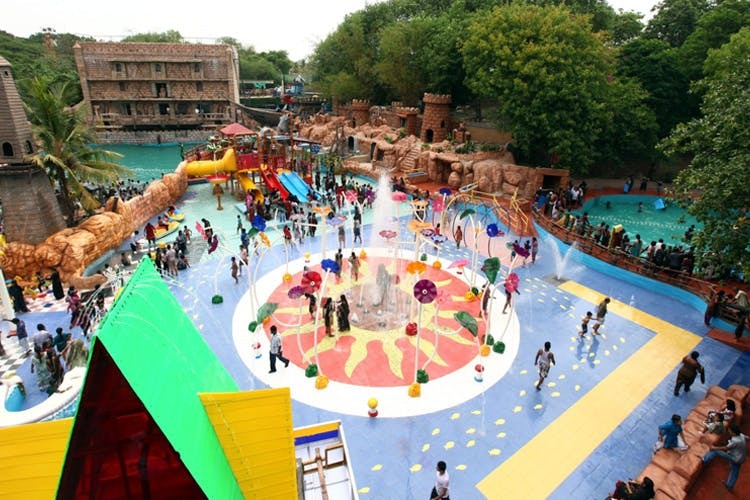 Having tried both the train and water rides, we feel that the main attractions are the water rides. There’s performing artists that do shows as well, there’s a water show called the Rocket Man which is a must see! There’s also a water ski show, a 3D play, and a musical fountain. There’s also a kids section too with tamer rides that are suitable for kids. Tiny roller coasters, trains, and carousels are what’s available.